CoastalBusiness.com Online Store Gets A Modern Update! Coastal Business Supplies has been a leading provider of personalization and gift product supplies, equipment, and information on the web for years, and their online store has been a great part of this continuing success! Now, with a modern update to coastalbusiness.com, they will be able to go even further within the industry to provide their excellent service and education. The updated web store features more intuitive navigation with a surprising depth of information, as well as a general facelift for all content to provide a premium user experience while browsing. The friendly and engaging redesign allows customers to easily find everything they need for a quick shopping stop, or everything under the sun to broaden their business’ potential, while still preserving the same great service, deals, and products they have always counted on! 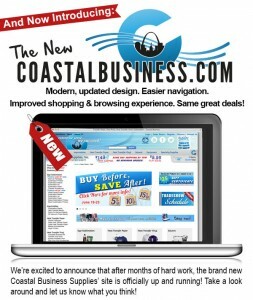 Check Coastal Business Supplies out on the web at www.CoastalBusiness.com today!